Timing is everything. Seriously. I have been on a cookbook binge (with some being sent to me from my wishlist – thank you!). I went out on a limb – listening to my seasonal cooking clock ticking – and ordered a cookbook that contained only lemon recipes. Just as I sat down to flip through the cookbook when it arrived, an email also arrived. Barbara, the creator of Hay Hay It’s Donna Day and just a wonderful blogger in general at Winos and Foodies, was hosting a new blog event that touched my heart. Barbara is a cancer survivor who is battling the disease yet again. As I mentioned in a previous post about Cancer Awareness Month, there isn’t a person I know that hasn’t been affected by the disease in a very personal way. My mother was diagnosed with it when I was a teenager. Fortunately, my mother quickly overcame the cancer…but the thought of losing ones mother as an 11 or 12 year old girl made an everlasting impression on me. Currently, two people I know have loved ones fighting cancer…and their story is, sadly, all too common. So, when I saw Barbara’s yellow themed food event in honor of Livestrong Day, my lemon yellow cookbook took on some added meaning. 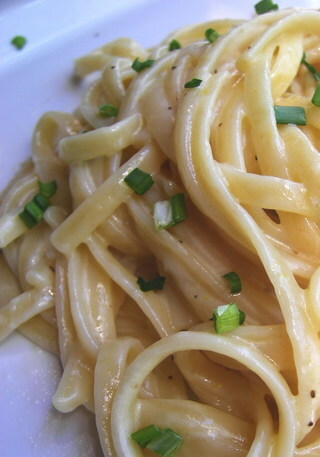 This Creamy Lemon Linguine is an adaptation on a recipe that I found in Lemon Zest by Lori Longbotham. I switched out the original fettuccine for linguine (i used Dreamfield’s in this instance). Despite the richness of the heavy cream, the lemon zest insures that the flavors and texture don’t get too heavy. It’s just the easiest pasta dish I’ve made in some time – 15 minutes from start to finish. It’s a great base recipe to enhance any way you see fit – veggies or smoked salmon on it would be delicious – or just to eat as is. I am a firm believer in the restorative power of food and cooking. I am also a believer in the power of the food blog community. Any small way we can all bring awareness to the things that affect us all – who doesn’t know a cancer survivor? – makes what we do with our blogs that much more significant. In honor of Barbara…and my mom…and everyone else who battles the disease…I will be posting yellow recipes all week on my blog. For more information on this event, check out Barbara’s post on her blog here. – Meanwhile, cook the fettuccine in a large pot of boiling salted water according to the specific cooking directions or until al dente. Drain in a colander, rinse with hot water, and drain again. – Add the butter to the pasta pot and melt over medium heat. Add the pasta, cream, salt and pepper and toss to coat the pasta. Increase the heat to medium-high and bring the sauce to a boil, tossing gently. Cook, stirring constantly, until almost all of the cream has been absorbed, 4-5 minutes. Serve immediately topped with the fresh chives. This looks great, very fresh and springlike! Here, here….the food bloggin community is amazing. The pasta does indeed look luscious. Love it, Tami – it looks so creamy! This looks delicious. Such a great recipe for Spring / Summertime. This is wonderful Tami. Thank you for your kind words and your support of A Taste of Yellow. Don’t forget a link to me for the round up. Wonderful light taste but heavy(wonder why). Plan to use it for a side dish soon. Does anyone else actually cook these dishes? The food turn out better than the pic you have. Nice recipe. Thanks for sharing!